I hope that you’ve had a wonderful week? It’s been lovely to see the sun shining and we have been trying to make the most of the weather with walking outside observing the beautiful late autumn colours. They seem so rich this year. 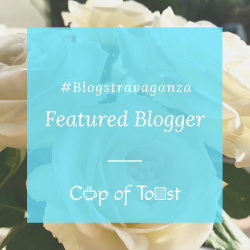 Anyway, straight on to this week’s #Blogstravaganza and of course first up is my featured post from last week. This week the badge is going to Sarah at Mud Cakes and Wine for this great post about participating in a food bank advent. It feels so important to give back, especially at this time of year, and this is a super idea. Thanks again for linking up Sarah, you can grab your badge below! Now on to this week’s #Blogstravaganza – welcome and thank you for joining in! Bloggers! All posts are welcome. All you need to do is read the rules below, and link up. If you need a hand with anything I am here to help so please drop me a note. Thank you for taking part! Hi Jo! I feel like I haven’t been here in ages! So good to be linking up again with you!